When I was preparing to move out to China, one of my biggest worries was that I’d struggle to make friends. Would my Chinese colleagues and classmates be interested in the same things as me? Would they want to grab a coffee, play tennis, or go out for cocktails? As it turns out, yes to all of the above. But, I’ve also found that there are lots of uniquely Chinese ways to 玩儿 (wán (r)) – hang out, or play. In this post, I'll introduce you to four ways of socializing in China that are really fun and are great ways to build close friendships with Chinese people. One of the reasons I love life in China so much is that it’s full of games. Whether you’re active and into ping pong or badminton (check out our introduction to Chinese sports here), or prefer to use your strategic skills in a game of cards, you’ll always find a Chinese person keen to play with you. Ask most people to name a Chinese game and they’ll say “麻将 (má jiang) – mahjong ”. And it’s true that 麻将 (má jiang) is played pretty much everywhere in China, from luxurious specially designed parlors in five star hotels to rickety old outdoor tables in the local park. 麻将 (má jiang) is played with 144 tiles and four players, and when I first watched some Chinese friends play I thought it looked terrifyingly complicated! In fact, it’s quite similar to the Western card game “rummy”: players take turns picking up and discarding tiles to try to create a winning hand. Like most good games, it combines strategy and skill with an element of luck. Although gambling is technically illegal in China, my Chinese friends often play for small amounts of money. If you’re invited to join in, it’s definitely a good idea to spend a couple of hours watching first to get the hang of the game, or getting some practice on one of the many online mahjong sites (especially if there is money involved)! Step outside after dark in a Chinese city, and you’ll smell the mouthwatering scent of street-side barbecue stands cooking up juicy 肉串儿 (ròu chuàn (r)) – meat kebabs and fresh, tasty vegetables. Customers sit at small tables next to the barbecue, washing the food down with cups of local 啤酒 (pí jiǔ) – beer, or (if you’re feeling brave) 白酒 (bái jiǔ) – usually translated as “white wine”, but it's actually hard liquor. This style of eating and drinking is usually associated with China’s 东北人 (dōng běi rén) – North-easterners, who have a well-deserved reputation for being the country’s best drinkers. But, luckily for those of us who live in South China, street-side barbecue and beer has spread all over the country! Chinese drinking culture is quite different from in Western countries – quietly sipping your own pint is just not how it’s done. Instead, people share bottles and toast each other by shouting 干杯 (gān bēi) – cheers and downing their drinks together. (干杯 (gān bēi) literally means “dry the cup”, but fortunately Chinese people tend to drink out of much smaller cups than we’re used to in Western bars and restaurants!). My top tips for drinking with a group of Chinese people are: toast everyone around the table (a way of showing respect), refill other people’s cups before your own, and if you’re worried about drinking too much, don’t stop joining in with the toasting – just use tea instead. 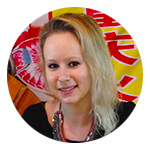 When I first moved to China, my husband’s colleague invited us over to his apartment for a dinner party. Apparently, we would be eating something called 火锅 (huǒ guō) – hotpot. I had no idea what 火锅 (huǒ guō) was, but I was excited for the chance to try something new. It turns out that 火锅 (huǒ guō) involves boiling fresh ingredients in a huge shallow pot of broth, usually flavored with chilies, garlic, or both. It’s a super sociable way of eating, as everyone helps to cook by adding ingredients to the pot, and the food is fresh and tasty. Tip: if handling uncooked meat, clean your chopsticks by leaving them in the boiling broth for a minute. Unfortunately, back then I didn’t know that seafood in China is usually so fresh that it’s alive until you cook it, even in people’s homes. When a plate of uncooked shrimps was brought to the table and one of them moved, I screamed and jumped out of my seat, accidentally smashing several bowls onto the floor! Luckily, we were still invited back for a second meal, and I’m now much more experienced with seafood hotpot. Even though eating out in China is super affordable and delicious, many Chinese still like to entertain friends at home. When invited to a Chinese home to eat, it’s a good idea to bring some fruit or snacks for your hosts, and expect to be asked to change into a pair of 拖鞋 (tuō xié) – slippers when you arrive. If someone had told me before I moved to China that I’d enjoy karaoke and do it frequently, I’d have laughed. 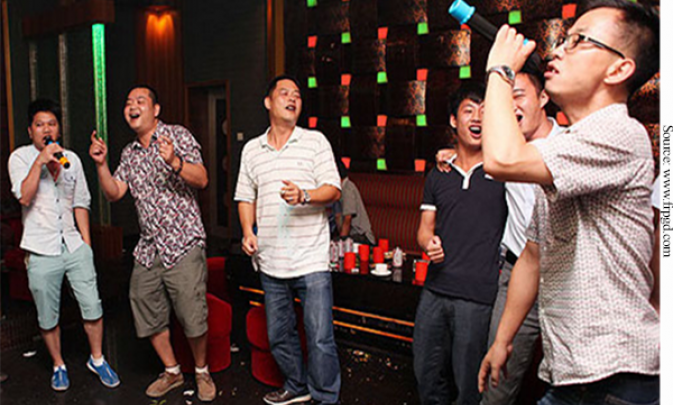 In fact, 唱歌 (chàng gē) – singing in a karaoke club is one of the most common ways for young Chinese people to hang out. Thankfully “KTV” (Chinese-style karaoke) is not like Western karaoke. Instead of testing your musical skills in front of a large room full of strangers, KTV involves booking a small, private room for just you and your friends. You use a machine to select songs, and order drinks and snacks from the many waiters and waitresses standing outside. At first, despite the more private setting, I still found KTV an awkward and uncomfortable experience. But, over time I discovered that Chinese people really don’t care if (like me) you’re not a great singer, as long as you’re having a good time. I’ve gradually grown to enjoy it, and would recommend any nervous first-time KTV-goers to relax, choose easy songs you’re familiar with, and if all else fails just find the best singer in the group and ask them to sing along with you! Are you keen to try any of these uniquely Chinese ways of socializing? Do you have any stories of hanging out with Chinese friends to share with us? We’d love to hear from you in the comments section!